One does not usually associate the Italian Air Force of WWII with strategic bombing. Yet, like other nations, it was a concern and consideration when doing long range planning. The result was the Piaggio P.108, the only Italian heavy bomber to see use during WWII. However, as with many similar projects, the lack of efficient mass production capability limited total production to 163 aircraft, many of which were lost in operations against the Allies. An outstanding feature of this aircraft was the two remote control turrets mounted just aft of the outer engines. Of course, one can only wonder what effect being near the engines had on serviceability of these guns, but it was a great idea. The guns were sighted through domes in the fuselage, a method also chosen by the late B-29 Superfortress. Some aircraft were used as transports by the Germans after September 1943, but lack of spares eventually led to their non-use. None survived the war to be placed in museums. Those of you who follow models know that Special Hobby is one of the many product lines of MPM. As a result, they have improved as MPM has improved. Today's Special Hobby kit is a far cry from the initial production kits in that they are much closer to main-stream injected kits than were those cruder productions of the past. This kit is typical of the latest and greatest. It has superbly engraved detail, no P.E., and injection molded clear bits instead of vacuformed ones. There is a goodly number of resin parts, most of them devoted to the cockpit. As a result, you get a very well detailed cockpit section for a 1/72 kit, with seats, consoles and control wheels. There are belts molded into the seats for that extra detail. There is no bomb bay in the kit and the doors are molded shut. Resin is also used for the gun barrels and for the engine exhaust. The props are separate blades fitting into a resin hub. You all are aware that I really hate separate blades and especially when the hub is not covered by a spinner. I don't see why the entire prop cannot be done either in resin or injected plastic. The Serie II aircraft is a late war build and so does not have a gun turret in the nose. T his means that the additional open nose section will not be used with this build. Instructions are quite well done with color information given with Gunze references. Unfortunately, their common name is not provided so those of us who don't use Gunze paints are left to guess as to what the shade might be. How difficult can it be to provide a common name for colors? 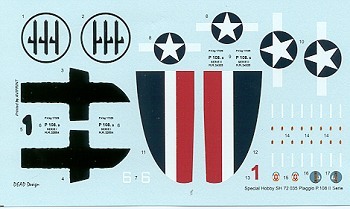 In the decal and camouflage section, the names for the exterior shades are given. Due to the limited use of the serie II aircraft, only two schemes are provided: one is the box art aircraft with the blacked out tail and fuselage markings typical of later war aircraft, and the other is a captured version as briefly used by the USAAF. It would have been nice to have a third option. Decals are very well printed and should work without any problems. Many modelers have awaited an injected kit of this Italian heavy with much anticipation. It should prove to be an excellent build and if it is as good as other more recent Special Hobby kits, is highly recommended. And here is what it looks like when built.